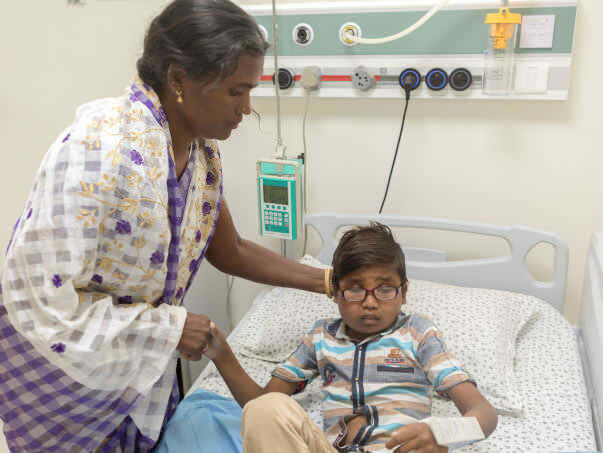 Nithin is a 16-year-old boy who has only seen suffering for three-fourths of his life. When he was just 4, he stopped eating properly. He wouldn’t eat vegetables or rice but only crave meat. If there was no meat at home, he would go to sleep hungry and crying. Initially, his parents thought he was throwing tantrums, but little did they know that everything else made him so uncomfortable that he preferred going hungry to eating. 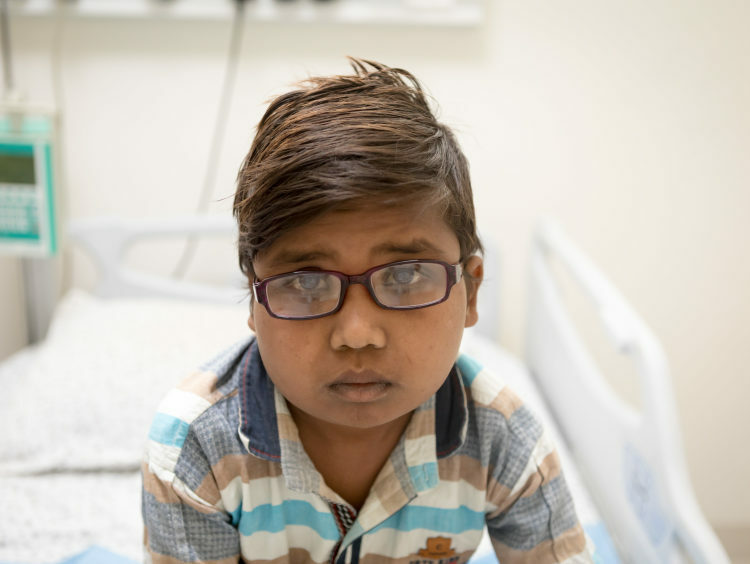 Nithin suffers from a rare disorder which makes him lose protein from the body and his blood count also keeps falling. When he was younger, he would need a blood transfusion once every 3 months and protein infusions from time to time. Over the years, his condition has gotten so bad, that now he needs infusions once every 10-15 days in order to keep his strength up. Whenever he has an infusion, he is fine for a week. Then he starts slowly getting weaker and weaker over the next few days, and then, it is time for his next infusion. He feels very uncomfortable and can’t sleep on the bed since only sleeping on the cold floor gives him any respite from his suffering. Not just that, he can barely eat, or sleep. All he does is lie down in the room and stay awake while suffering in this misery. For a 16-year-old, this kind of life seems straight out of a nightmare. Nithin can barely do anything like other boys his age. At 16, he should be full of energy and hopes for the future. But he can’t even go to school because of his weakness. Before, for every 2 days of school, he had to skip 2 or 3 more to stay home and rest. He really wants to play with his friends and play outside with them, but his overly fragile health doesn’t let him do anything. All the engagement he has is when his younger brother Nikhil sits down with him to talk to him. 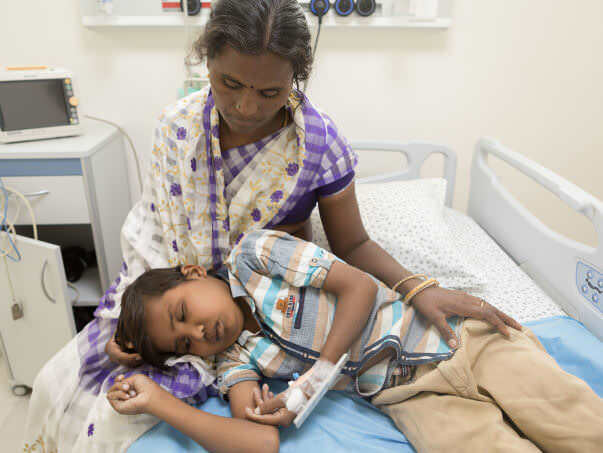 Nikhil, his younger brother, is 8 years old and cries at seeing his older brother’s pain. He keeps asking his mother how long it will take for Nithin to get better. He is always ready to forego playing with his school friends to spend time with his brother, sitting next to him on the floor, talking. 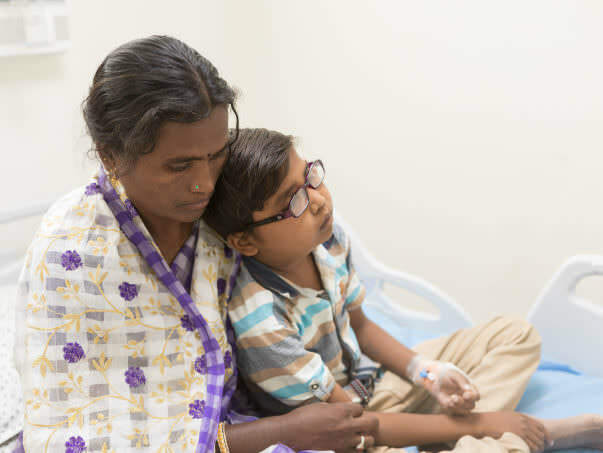 Nithin’s parents often get overwhelmed at this, and they wish is for their older son to get better and have a normal life like the others. But the biggest hindrance they face is the lack of funds. 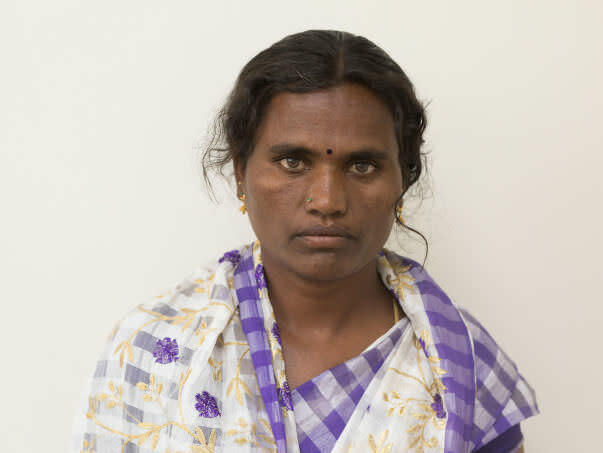 Nithin’s father, Suddu, works as a daily wage labourer for a meagre Rs 2,000 a month. 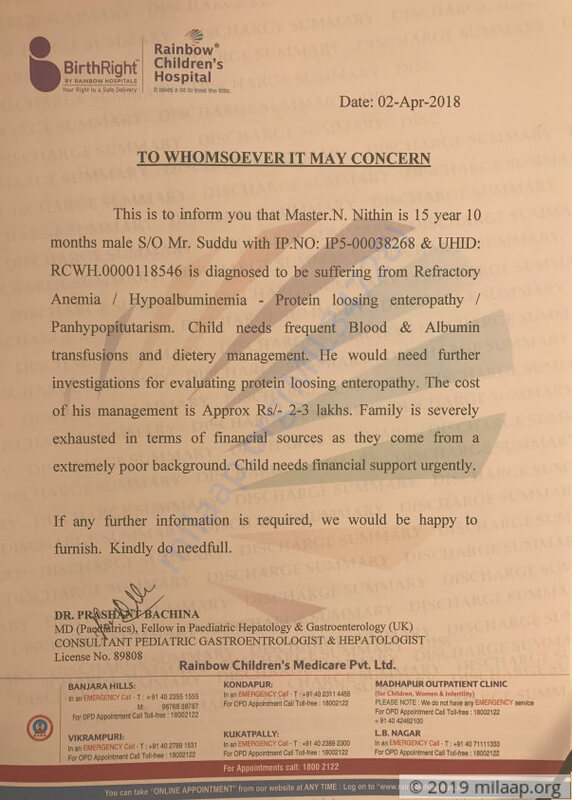 His income isn’t even enough for getting them two meals a day, so affording treatment worth Rs 3 lakhs is out of the question for him. Over the years, Nithin’s family has spent over Rs 15 lakhs towards keeping him alive. They have borrowed money from everyone they know, and now there is no one who can help them out, but you. 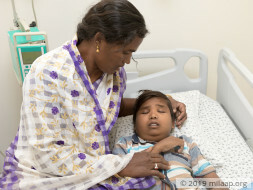 Nithin can recover, but for that to happen, they need your help. 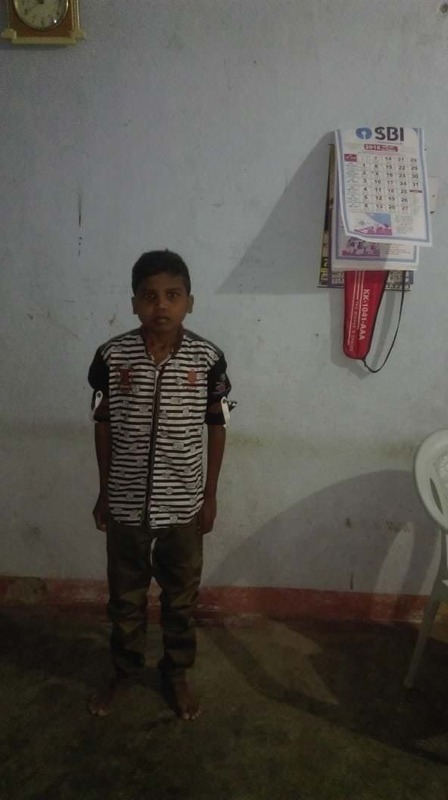 Your contribution can save Nithin and give him the healthy and happy life he deserves. Thank you for the support shown towards Nithin. He is at home at present and doing well. 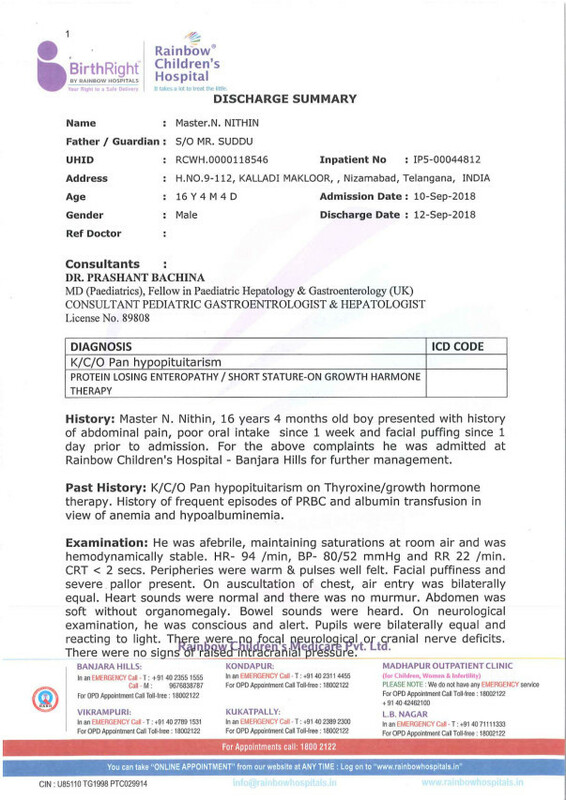 He is on continuous medication and needs to be taken in for regular check-ups. He is able to eat normally as well. Please continue to support Nithin through his journey by sharing his campaign with your friends and family. Dear Supporters,Thank you for your love and support. Nithin is currently at home and is doing fine. He is advised to go on regular check ups to the doctor. Here is the recent photo of Nithin. Thank you for the love and support you have shown towards Nitin. He is discharged. Currently he is at his home and doing fine now. Below is the discharge summary provided by the hospital.